Longhedge Show Processing are proud to sponsor the Dog Vegas Combined 1-7 Large ABC Jumping Qualifiers. Come and see our at-show ringside entry and display service at next year's Finals held at the Dog Vegas Show at Matlock in July. 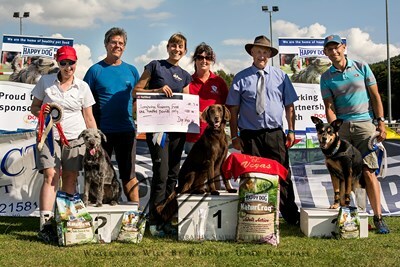 Longhedge Show Processing are also official sponsors of the British Agility Championships held at Houghton Hall Equestrian & Alpaca Centre in June, where we provide comprehensive at-show services including ringside inputting of results and remote display for competitors, as well as updating the current standings and instantly producing the list of Finalists after the last qualifying round. Many thanks for your help, as always you are so helpful and efficient. Just wanted to thank you for our E-Mail and compliment you on your processing service. You are the only processing service I know of that confirms you have received our entries by E-Mail. Just want to say how excellent your communications are at Longhedge. Love the emails you send confirming that entries are recieved & any changes & show information is always sent out so promptly. I have always found you a pleasure to deal with. The other processors could learn a lot from you guys! Keep up the good work! I want to say a big thank you to you for changing our days, I have messaged you before (sometime ago) and found that you are always very friendly and helpful. Just wanted to thank you for sending these notices out. The show updates and sending us the address for refunds are really appreciated and make Longhedge a great show processing service. I love the way you work - I know where I am! Love your efficiency, thank you! I am always so impressed with your entry system!